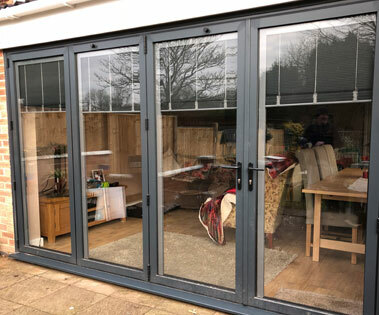 Midland Bi-folds offer three types of Integral blinds designed for use in double glazed units. They are manufactured in accordance with high technical specifications and stringent production standards. The slat raising, lowering and tilting functions are achieved using a rotational magnetic transmission through the glass, guaranteeing the units hermetic seal. 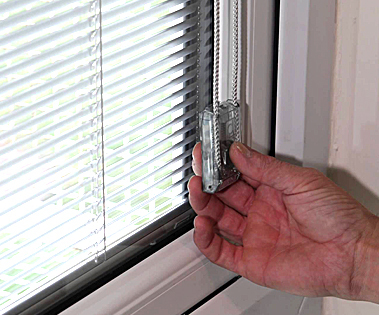 This Venetian blind system is manually-operated and utilises a patented magnetic device to operate the blinds encapsulated within 20mm cavity double glazing units. A magnetic slider, placed on the right or left-hand edge of the glass, allows the slats to be raised and tilted. The blind is raised and lowered by moving the slider up or down and is tilted by slightly lifting or lowering the same slider. Equipped with a warm edge spacer bar as standard the S-V-System offers high energy performance and, consequently, savings on heating and air conditioning costs. 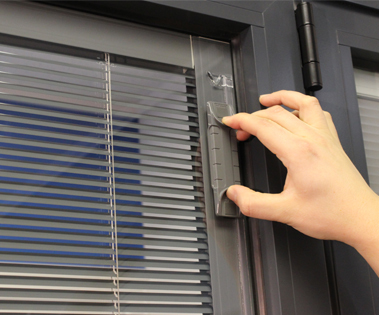 The ScreenLine® C System Venetian blind is designed for use in double-glazed units. The external magnet, fixed to the internal glass by double-sided high performance adhesive allows perfect alignment with the internal magnet. Raising and lowering is controlled using a continuous cord loop that drives the external magnet. The cord is held lightly under tension by a cord tensioner, rotational knob or wand on the glass directly below the external magnet. 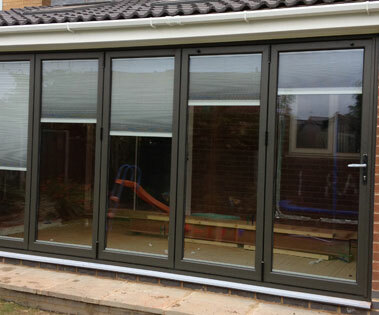 The ScreenLine® C System is availadle in a wide range of colours, please contact us for more information. 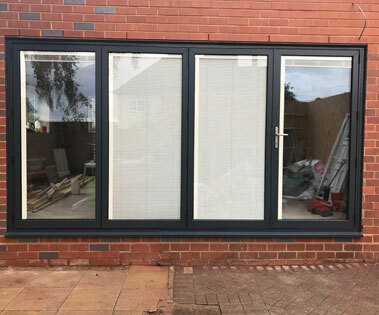 The ScreenLine® SL20S is a manual system comprising a 14 mm pleated blind integrated within a double glazing unit with 20 mm cavity. The blind movement is achieved by moving a magnetic device positioned centrally on the outer surface of the internal glass across the glass surface. This external magnet interfaces with a similar internal magnet located in the moveable head-rail and it is so designed to absorb possible glass deflections. 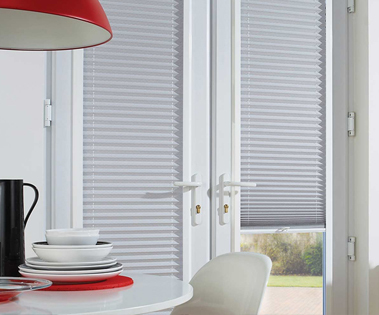 The application of Verosol pleated blind fabrics, coated with an aluminium layer on one side, reduces solar heat gain and improves U_value, whilst regulating the light passing through. Light transfer down the blind edge is eliminated by the use of special “L” shaped-side guides. 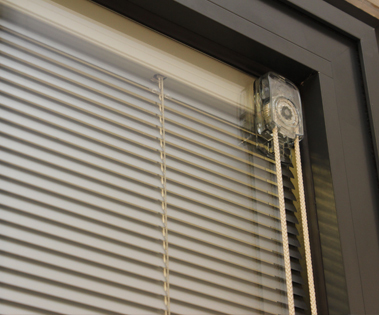 The ScreenLine® SL20S is an extremely versatile product with simplicity of control; the blind can be adjusted to any position at any inclination from 0° (horizontal) to 90° (vertical). The blind can be moved in every direction; from right to left, from left to right, from the top to the bottom and vice versa. The system is also highly modular; the basic model is installed in a 20 mm cavity. It is possible to install two blinds within the same unit. The seal integrity is not compromised in the SL20S system. The special features and the high product quality are an effective solution to the problem of light and heat regulation in garret/ attic environments, providing an easy and lasting solution of shading for roof windows, whatever the angle. 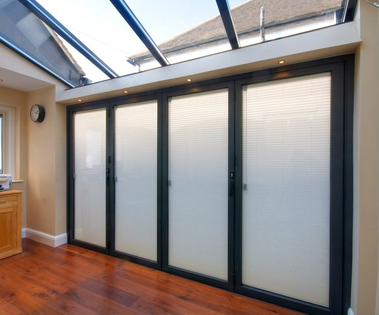 The ScreenLine® SL20S System is available is 3 colours, white, grey and cream. 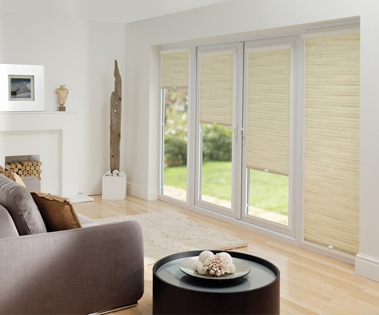 GET AN INTEGRAL BLIND QUOTE TODAY!